Benches and doorways in some areas of Paris are crowded with rough sleepers every night and the banks of the Seine have often been host to ‘tent cities’. While most politicians and tour operators try to hide the city’s dark side, one football tournament draws attention to these problems and challenges perceptions. When Nicolas Sarkozy promised in 2006 that by 2008 no one would be forced to sleep outside any more, social workers and lobby groups shook their heads in disbelief. A presidential candidate at the time, Sarkozy was playing on the emotions expressed by voters across France. But empty promises turned out not to be enough. Lobby groups for the homeless started a campaign for housing as a basic right for everyone. Their efforts led to new legislation that placed access to housing on the same level as education and healthcare. Even though the right to a house is now legally enforceable in France, the bureaucratic system proves too complicated for many and homelessness remains a problem. Statistics on housing and homelessness in France differ hugely, depending on what definition is used. According to the European Federation of National Organisations Working with the Homeless (FEANTSA) the proportion of ‘poor households’ is 11 per cent – about the same as the EU average. The National Institute of Statistics and Economic Studies (INSEE) states in its 2011 report on housing in France that 685,000 people are homeless, with another 85,000 living permanently on camp sites or in mobile homes. They estimate that almost 2.8 million people live in difficult living conditions, the majority in overcrowded flats. Although the situation on the streets of Paris has improved slightly over the past years, support groups say that a lot more still needs to be done to change the situation for the city’s most vulnerable. In a city traditionally associated with fashion, glamour and romance, social justice issues do not necessarily seem a natural fit. Yet it is important that people think about poverty and change their perceptions about homelessness, says Homeless World Cup President Mel Young. With the annual international football tournament for homeless people taking place right next to the Eiffel Tower this week, both French and tourists alike have an opportunity to engage with people less well-off than them. “Around the world, people are more and more prepared to listen to poverty issues. But when you meet homeless people and you see for yourself what an amazing skills they have, it changes you”, says Young. What happens when you put homeless and vulnerably housed players from around the world together on one field can only be described as magic. Mexicans in bright green tops chant from the spectator stage. A Spanish player with a broad, toothless smile asks everyone to take a picture with him, whilst Norwegian supporters with their Viking hats cheer on their national team. The park around the Eiffel Tower is always buzzing with activity, but this week’s added energy cannot be beaten. When it’s the Scotland women squad’s turn to take to the stage in the unforgiving French heat, their male counterparts sing the famous ‘Flower of Scotland’ football anthem from the top of their lungs. Proud Homeless World Cup President Mel Young- himself a Scot- claps and cheers as he sees his fellow countrymen gain their first victory of the tournament against Kyrgyzstan. On the strip of grass next to the pitch the Dutch in their recognisable orange kit do their warm up session. The South African team next to them give their own twist to their warm up: they sing, clap and dance as if they were in the finals already. The Homeless World Cup continues this week with teams from all continents playing for a total of six trophies in the male competition. There is also a special Women’s World Cup, in which a total of sixteen nations compete for the world title. 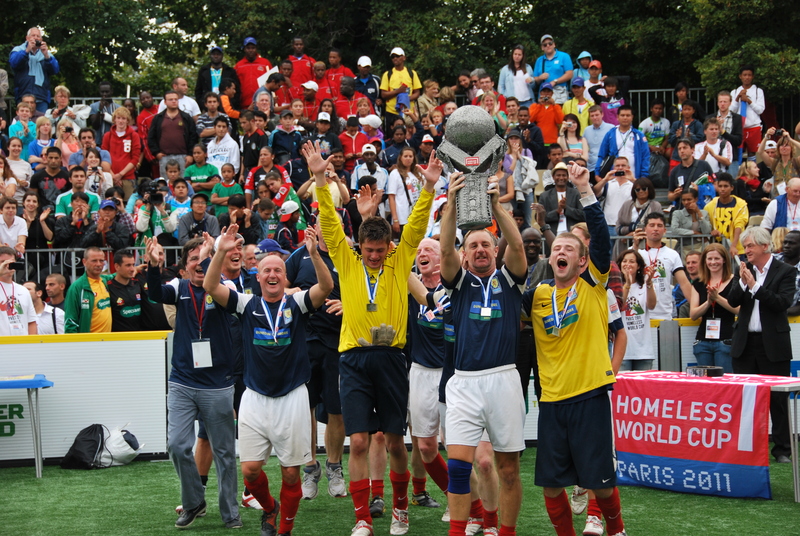 The finals of both the men and women’s Homeless World Cups are on Sunday 28 August.